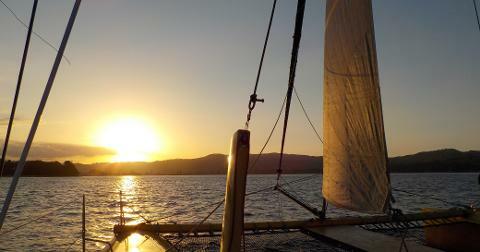 There is nothing quite like being on the water on the Coromandel at dusk! Our 2 hour sunset trip departs Buffalo Beach 6pm, returning by 8pm. The perfect way to end a day in Whitianga. A relaxing sail in the evening breeze going where the wind takes us. Sail the boat or relax on the comfortable trampoline decks on a beanbag. Watch the sun go down and the moon come up. Trip includes a local brewery beer and some local smoked seafood snacks. Sorry kids, this trip is for adults only.